Dr. Ronald Lederman received his undergraduate and medical degrees from the University of Michigan in Ann Arbor. He is a board-certified orthopedic surgeon with an additional one year of fellowship training in lower extremity orthopedics. 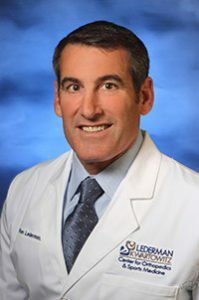 Practicing since 1994, Dr. Lederman is a leader in general orthopedics, including sports medicine, arthroscopy, and joint replacement surgery. He specializes in foot, ankle, and knee surgery, including minimally invasive total and partial knee replacements, and he has extensive experience treating shoulder and hand conditions, including rotator cuff tears and carpal tunnel syndrome. Dr. Lederman uses the latest technology and minimally invasive surgical procedures to reduce downtime and pain and return patients to the activities they enjoy. He and Dr. Kwartowitz are the first orthopedic surgeons in a major metropolitan area throughout the country exclusively providing MLS laser therapy.